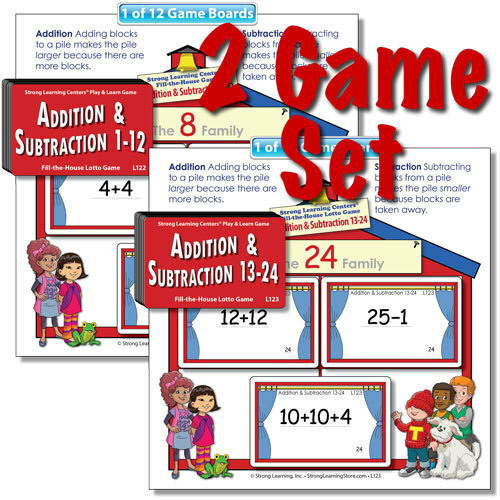 SPECIAL-Beginning Addition & Subtraction 1 and 2-SAVE $10.00! 2 GAME SET. Kids learn beginning addition and subtraction by "filling the houses"! Similar to "bingo" and "lotto," playing the Addition and Subtraction 2 Fill-the-House Lotto Game gives kids lots of fun practicing simple addition and subtracting numbers that total between 13 and 24. In no time at all, kids naturally learn the concept of addition and subtraction (without regrouping). The four window cards of the "6 Family" house consist of: "2+4, 3+3, 10-4 and 8-2." The four window cards of the "9 Family" house consist of: "4+5, 3+6, 10-1 and 9-0." For 2 to 24 players or can be used one-on-one. This A123 (Two game set of L122 and L123) is ideal for play with up to 24 players.